9054 Seth Thomas Milan mantel clock. This is one of the nicer models of the City Series. The case is quarter-sawn oak in the original finish. It is in good condition but note that there is a 3 inch piece of veneer off the bace in the front. It has been colored in so it is hard to detect. The porcelain dial is signed and in good condition. It has a heavy cast brass bezel with a thick beveled glass. It retains the original hands, key and pendulum. This is an eight-day clock with hour and half-hour strike on a resonant cathedral gong. The movement will need cleaning to be put in good running order. 9055 Seth Thomas Wales mantle clock. 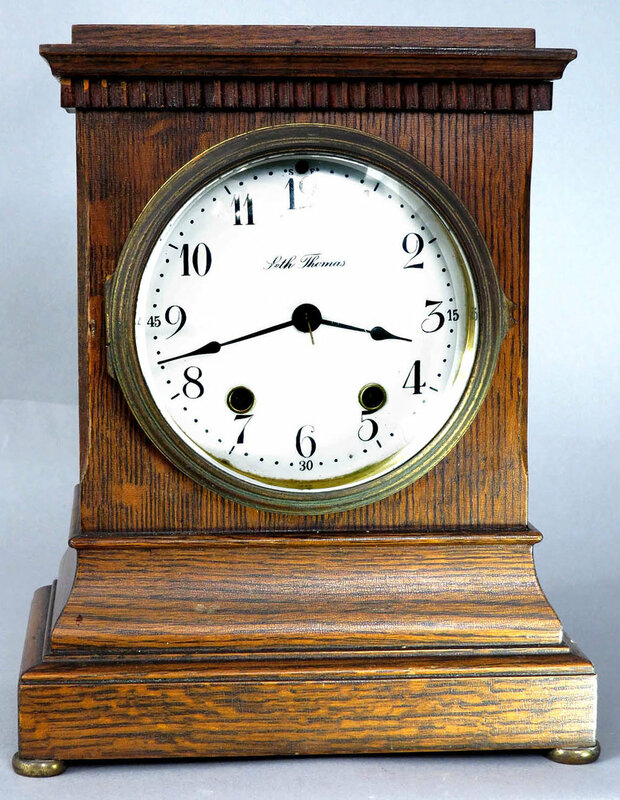 Another example from the City Series, this clock has a solid oak case in good condition with the original finish. There is houndstooth molding around the top, brass feet and there are no case damages or problems. This clock has a perfect signed porcelain dial and a heavy cast brass bezel with convex beveled glass. It retains the original hands, key and pendulum. This is an eight day clock with hour and half-hour strike on a resonant cathedral gong and it is running. 10 ½ inches tall. $155. 9056 Seth Thomas Turin Mantle clock. Another model in the City Series, this clock is a miniature version of the Wales. The small size makes it very appealing. The case is quarter-sawn solid oak in the original finish which has been cleaned and polished. There are no case problems or damages at all and it has brass button feet. The porcelain dial is signed and in perfect condition without any chips or hairlines. The bezel is heavy cast brass and it has a convex beveled glass. It comes with the original hands and pendulum. This is an eight-day clock with hour and half-hour strike. It is running but note that the cathedral gong and the hammer are missing. 9057 Seth Thomas miniature mantle clock. The signed porcelain dial is perfect without any chips or hairlines. It has a heavy cast brass bezel and a convex beveled glass. It comes with the original hands and pendulum. This is an eight-day clock with hour and half-hour strike on a resonant cathedral gong. It is running and actually goes a few days beyond eight days. Only 8 inches tall. $165. 9058 Seth Thomas Prospect mantle clock. This is a very nice look in good, clean, original condition. It needs nothing other than to be put on your shelf and enjoyed for years to come. It has a mahogany case with the original finish which has been cleaned and polished. It has satinwood inlay on the front plus brass feet. There are no case damages or problems at all. The signed porcelain dial is perfect, without any chips or hairlines. It comes with a heavy cast brass bezel and a convex beveled glass. It retains the original hands, pendulum and key. This is an eight-day clock with hour and half-hour strike on a resonant cathedral gong and it is running. 10 ½ inches tall. $175. 9059 Seth Thomas Tudor mantle clock. It has a mahogany case with the original finish which has been cleaned and polished. The case is in good condition but for a slight crack in the veneer on the top but that is not very visible. It has a signed porcelain dial with one small flake at the very top just above the 12. There is a heavy cast brass bezel with a convex beveled glass. The hands and pendulum are the originals. This is an eight-day clock with an hour and half-hour strike on a resonant cathedral gong and it is running. 8 ½ inches tall. $115. This clock has a nicely refinished rosewood case. The veneer is perfect without any damages but the trim around the door has been repainted gold. It has a zinc dial with a raised chapter ring and that dial has been poorly repainted. It has a good label plus the original hands, glasses and pendulum. The movement is eight-day with hourly strike and Geneva stops. It is overdue for a cleaning and I notice at least one bushing that will need attention in the near future. 15 ½ inches tall. $75. 9061 Seth Thomas, Thomaston, Conn.
“As is” and perhaps useful for parts, this clock has had numerous alterations. The dial is a modern replacement, the movement is not original to this case and the bell has been changed. The mahogany case has been refinished but the veneer across the front base has been replaced and the trim has been repainted gold. The 30 hour movement is unmarked and has an hourly strike plus alarm. 15 ½ inches tall. $45. 9062 Waterbury Nebraska mantel clock. Waterbury made a number of clock models with domestic and foreign named cities and states such as Vermont, Kentucky, Maine, Glasgow, Buckingham etc. This one shows up in the 1912 catalog at a price of $13 which was a considerable amount at that time. It has a very nicely refinished solid mahogany case with brass feet. There are no case problems or damages. There is a signed porcelain dial which is in good shape but for one very faint hairline above the numeral 5. It retains the original hands and pendulum. This is an eight-day clock with hourly strike on a resonant gong and half-hour strike on a brass bell. It is running. 9063 Ansonia “Gothic” mantle clock. The case is mahogany and it had a dark finish. Someone refinished the clock but did not remove all of the dark finish. Thus, the case would look better if it were cleaned up a bit. There are no case damages. It has a signed silvered dial which is in reasonably good condition. There is a cast brass bezel and a convex beveled glass. The hands and key are original while the pendulum is old but replaced. This is an eight-day clock with hourly strike on a gong. The movement will need cleaning to be put in good running order. 9064 Herschede Westminster chime electric pendulum clock. Probably made in the 1920s or 30s, this clock represents a transition from pendulum clocks to electric clocks because it has a pendulum movement which is electrically wound. It has a very nice mahogany case with the original finish which has been cleaned and polished. There are no case problems or damages at all. The signed silvered dial is in good condition and it has separate applied brass numerals. There is a brass bezel and a convex glass. It has a very good instructions label plus the original hands and distinctive pendulum. This clock strikes Westminster chimes on each quarter hour on 4 rods. It is running but will need some minor adjustment to get the hours to strike properly. 5059 Seth Thomas "Prospect" mantle Clock. This clock has a clean, refinished oak case with turned brass feet. The clock is in near perfect condition without any significant case problems. There is a brass bezel with a convex beveled glass. That bezel could use polishing. The signed painted dial is convex to resemble porcelain. There is a slight amount of wear in the numerals. The hands and the pendulum are the originals. This is an 8 day clock with hour and half hour strike on a gong. It runs a short while for me and stops. .